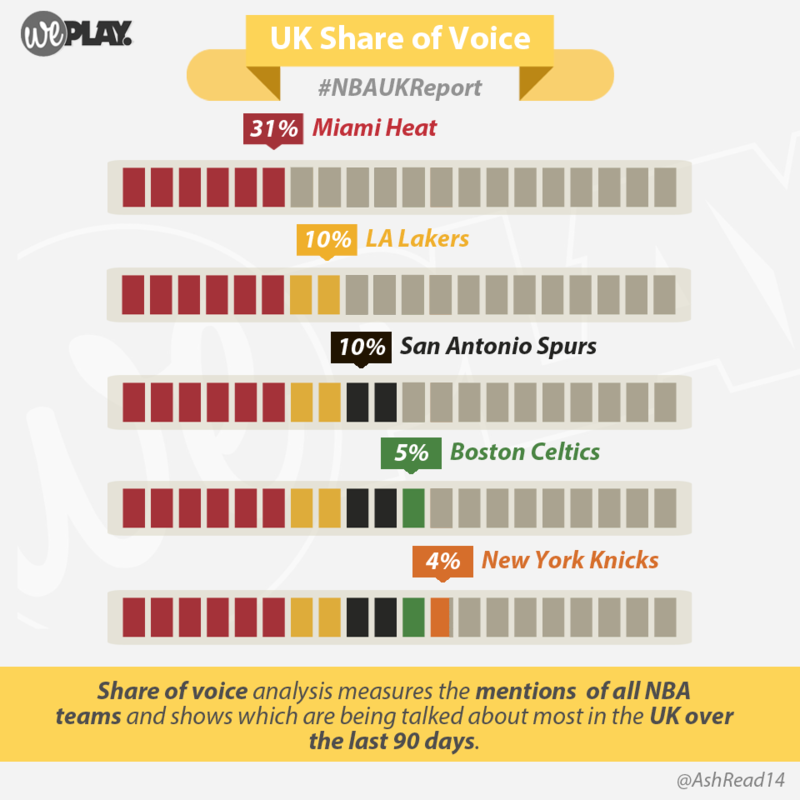 We Play released NBA in the UK: Challenges, Opportunities and Social Media ROI which is available as a free download via the company’s website. 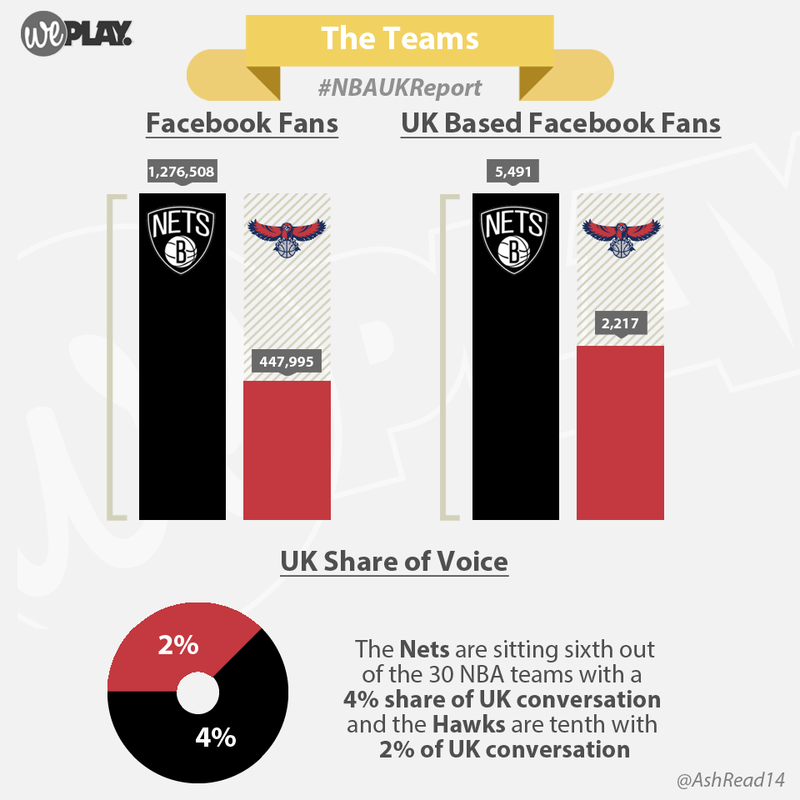 The report takes an in-depth look at the NBA’s UK fan base in order to identify the sports business opportunities and challenges the organization faces ahead of January’s Global Game in London between the Atlanta Hawks and Brooklyn Nets. Ash Read, Senior Account Manager at We Play – The Sports Social Media Agency, shared insight about the report released on Tuesday with the Sports Techie community blog. The Atlanta Hawks and Brooklyn Nets have both made the trek over the Atlantic to Europe before. The Hawks took part in the back-to-back games against the Orlando Magic, the NBA’s first ever preseason games in London back in 1993. This will be the Nets’ third game in London after matching up the Miami Heat in a pre-season game in 2008.They took part in the first regular season games in the UK with back-to-back games against the Toronto Raptors from Canada. WePlay.co are monitoring the growth of all 30 NBA teams social media presences, and this analysis coupled with the company’s proven understanding of sports fan behavior formulated We Play to develop their Fan Evolution model, which documents the basketball fan journey from casual to avid – or, on a commercial level, from passive bystander to retained customer. How do you track revenue and ROI from social media? This is the $1 million question. And the We Play report goes some way to answer that question. How do you track revenue and ROI from social media? This is the $1million question. And the We Play report goes some way to answer that question. Sports Techie, The 2014 NBA UK game fan experience in January is going to be watched online at NBA.com and NBATV on new smartphones and tablets received as Christmas or Hanukah gifts by fans around the world. 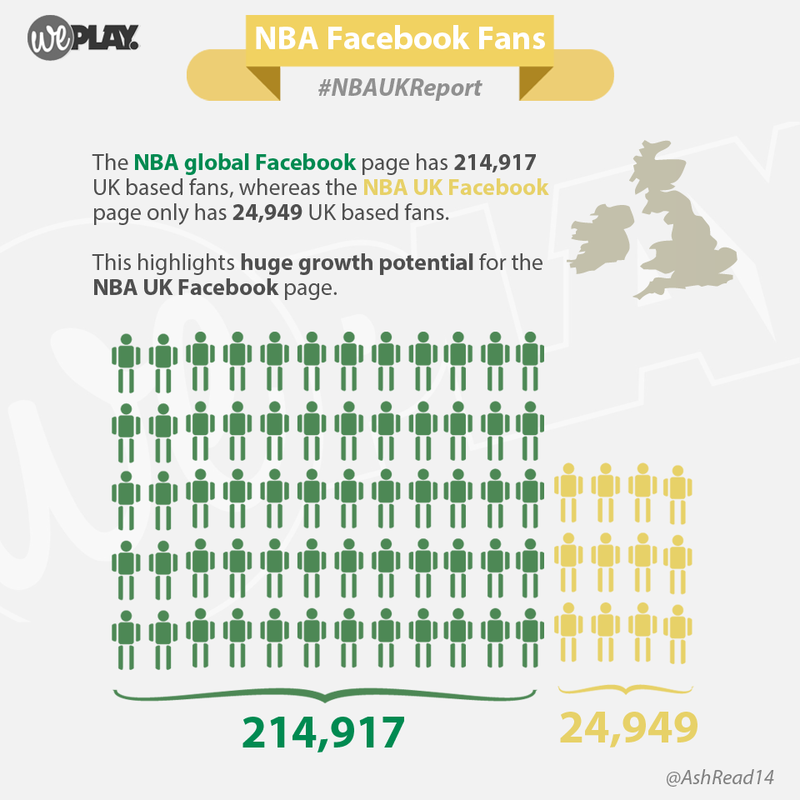 The free WE Play report indicates that social media and in particular Facebook are having an impact with the growth of the NBA UK sportsbiz initiative. The NBA’s global effort to spread the love of the game we have in the United States is on schedule. Here in the U.S. kids grow up first playing nerf ball, and then dunk hoops, until finally after many hours of training and play, you have earned the respected privilege to represent the National Basketball Association on a NBA sized, beautiful wood full court, as one of the top five v five basketball players on this planet. The NBA has been marketing throughout the world for decades. I was an official blogger in 2012 at the Global Sports Forum Barcelona in Spain and spoke to Mark Tatum, the NBA Executive VP of Global Marketing Partnerships, about their grassroots and digital campaigns in China that contributed to the worldwide explosion of Houston Rockets, Jeremy Lin, who has Chinese roots. Lin was in the right place at the right time by no accident; rather it was the result of the NBA business plan that also extends to NBA UK. The British allure of Premier League football (soccer) on kids is certain, however, thanks to the hard work of the NBA UK, the opportunity for English fans of all ages and gender to engage with a different and fast growing Professional sport via mobile device means is why sponsors and marketers should consider coming aboard to the ongoing International expansion by the NBA into the England. Because this is the third time in the UK, the NBA influence with boys and girls has undoubtedly changed the mindset of young kids about basketball. Hosting the 2012 Olympic Games brought many of the top players from around the world to London enabling both adults and kids an opportunity to further engage with one of my favorite sports, basketball. If you like the NBA, I suggest you follow the Nets, Hawks and NBA UK on Facebook no matter where you are. Also, follow WE Play hashtag #NBAUKReport and start playing NBA fantasy basketball by drafting @KingJames. By the time our nearly six-month old son is a teenager, an All-Star will hail from Great Britain and a permanent team will play in London, all according to the NBA business schedule. Hopefully by 2026, the NBA plan will enable Seattle to have the 1979 NBA Champion Sonics I got to see play back in town so our son can have his own hometown players like Jack Sikma ad Slick Watts to grow up emulating on the court whenever he plays hoops for fun, exercise or to compete; just the same as the Global Games and NBA UK brings to children and fans in England and worldwide. Our gratitude goes to Ash and We Play for sharing their report with the Sports Techie community blog.